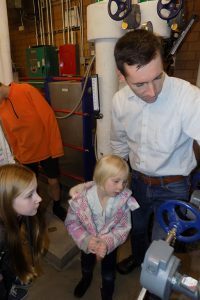 Colorado schools are saving $102,000 annually through the Colorado Energy Office’s Energy Savings for Schools (ESS) program. Energy costs are the second highest operating costs K-12 schools face today. It’s estimated that more than $2 billion could be saved nationwide by improving energy efficiency, according to a 2011 study by the U.S. Environmental Protection Agency. Thanks to CEO’s ESS program, local schools are becoming more energy efficient and accessing that savings. To date, CEO has provided 46 schools with an energy audit or technical support, and those schools are implementing priority efficiency projects. Through the program, schools receive free on-site energy and water audits from an energy engineer; technical support and energy coaching; an evaluation of renewable energy opportunities; implementation support and help identifying existing funding and financing options for completing projects; connections with peer schools and a platform for sharing ideas and knowledge; recognition for the school’s efforts and opportunities to engage students; and (on a case-by-case basis) an energy monitoring device to measure electricity use and access to real-time data on a web-based dashboard. When a new school joins the program, the ESS team works with the school to collect and review building utility data (electricity, natural gas and water) before the site visit. “Reviewing utility data before a site visit gives us insight into how a building is performing and highlights potential areas for improved efficiency. Concerns expressed by school staff are used along with insights gained from the historic utility data to help customize our approach for each unique facility,” energy efficiency engineer John Butler said. Often, students shadow the audit and learn about recommendations for improved efficiency. They also are encouraged to get more involved in how their schools use and can conserve energy to create lasting impacts. After the site visit, the energy engineer prepares a customized report with recommendations for the school. To help fund recommended projects, ESS staff identifies other applicable CEO programs, local utility rebates and other state and local programs for schools to leverage. Through the ESS program, Moffat County High School partnered with a local Steamboat Springs firm to design a new capacitor bank to correct its electrical power factor. The project had an initial cost of $17,000 but will save the school over $3,800 annually. The school also installed an energy monitoring device (e-Gauge) that measures electricity use and provides access to real-time data. The e-Gauges are provided free of charge to eligible schools participating in the ESS program and help school staff and students better understand the real-time impacts of energy use. Local schools are invited to access ESS resources to optimize performance, save money and begin to develop a culture of conservation among students and staff. CEO is recruiting schools from Colorado’s rural and low-income areas to participate in the program. Schools interested in the program should contact program manager Susan Blythe at 970-207-0058, ext. 310 or visit bit.ly/CEOenergysavings. Writer Katie Kershman is with the Brendle Group, an engineering and planning firm.